Macmurray’s primary criticism of the Western philosophical tradition is that it begins from a theoretical, rather from than a practical, standpoint. In The Self as Agent, he critiques and corrects Descartes’ ‘I think’ with the ‘I do’, a construction of the Self existing first and foremost as an agent of action in the world. In chapter 1, ‘The Crisis of the Personal’, he expresses his concern that philosophy’s emphasis on objectivity necessarily results in an atheistic approach. Being unable to accept the latter, he rejects the former in preference to the subjective or personal. In chapter 2, ‘Kant and the Romantics’, and chapter 3, ‘The Rejection of Dualism’, Macmurray considers the critical philosophy of Immanuel Kant, suggesting that we disregard Kant’s limitation of knowledge to the empirical and reject the resultant dualism between theory and practice. He distinguishes between the egocentric and disembodied Subject (as in Descartes and Kant) and his own notion of the active, embodied and, most importantly, social agent in chapter 4, ‘Agent and Subject’. Chapter 5, ‘The Perception of the Other’, seeks to give content to form by considering the personal nature of the Self in perceiving the Other-than-Self. 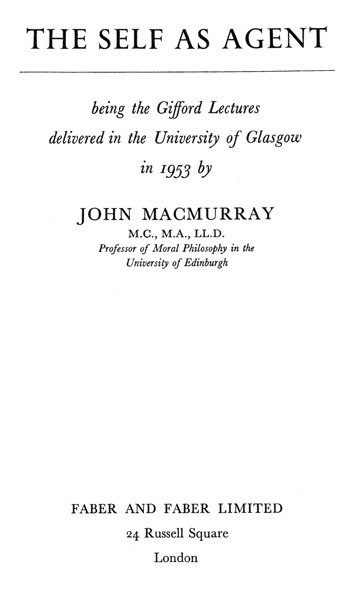 Macmurray addresses the implications of his starting point of the active agent as opposed to the knowing thinker in chapter 6, ‘Implications of Action’, leading toward a theory of action that includes knowledge and concluding that the possibility of action ultimately depends on the agency of the Other. In chapter 7, ‘Causality and the Continuant’, he suggests that the idea of a cause is problematic because it implies an agent that does not function as an agent; Macmurray theorises instead a Continuant that exists outside of time as a non-agent responsible for natural laws. In chapter 8, ‘Reflective Activity’, he asserts that all theoretical activities, or modes of reflection, derive from practical action by an intentional limitation of attention. He extends this in chapter 9, ‘Modes of Reflection’, focusing on this aspect of theoretical activity (which he calls ‘negative intention’) to consider the relationship of the two reflective modes, one intellectual and the other emotional, to action. In the final chapter, ‘The World as One Action’, having clarified the limitations of his study in regard to purpose and method, he argues the necessity of thinking of the world as a unity of action or intention in which we act as personal, relational agents.